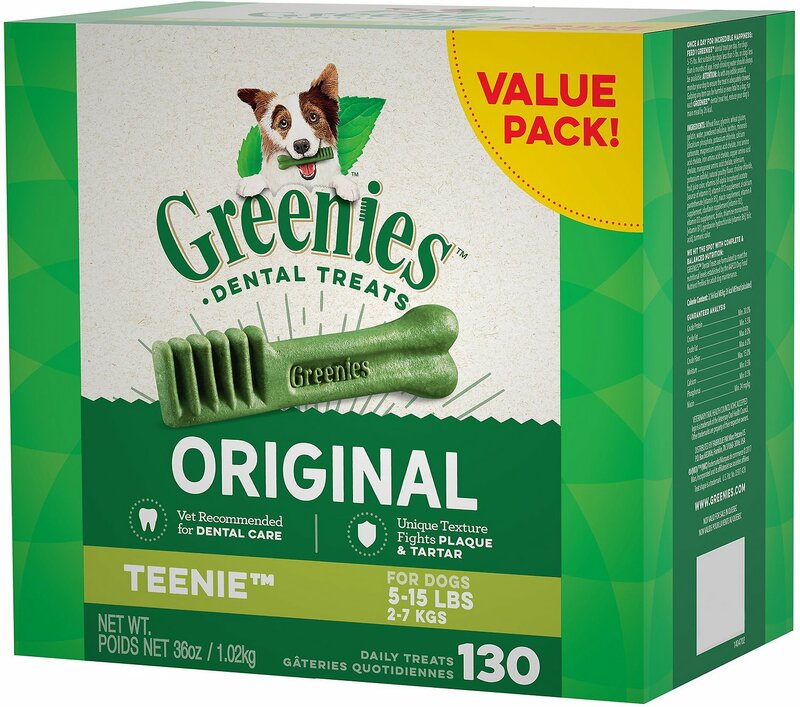 Give your pal the mouth-wowing treat that boosts dental health with Greenies Teenie Dental Dog Treats! Made with all-natural ingredients, these uniquely-shaped snacks are designed to control and remove disease-causing plaque and tartar, all while putting an end to dreaded doggie breath. 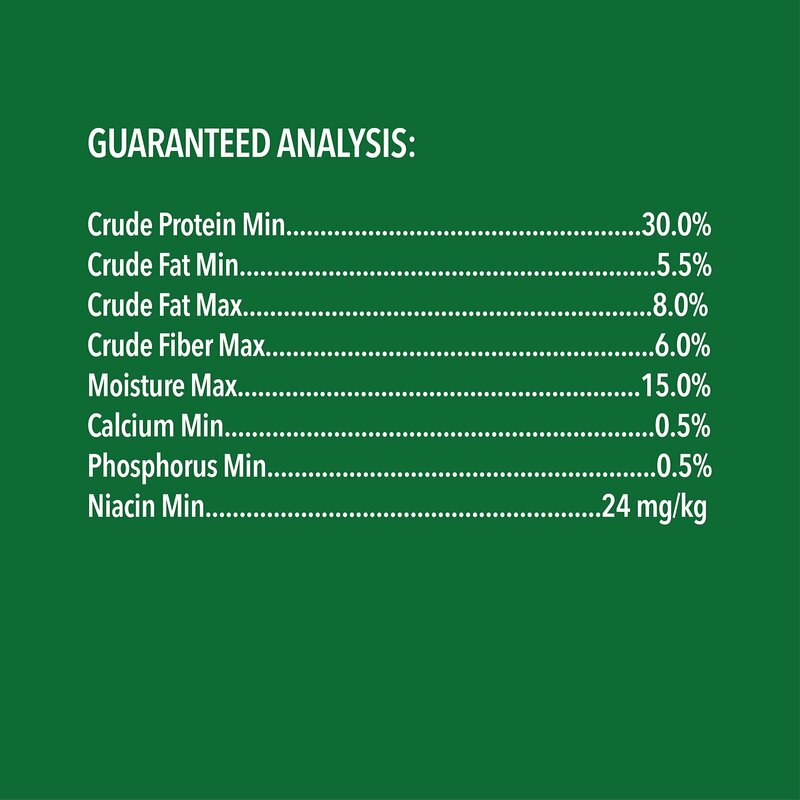 Each tasty chew features added vitamins and minerals, and is formulated to provide complete and balanced nutrition for adult dogs. Keep the cuddles coming and give your best friend the dental health he deserves with these veterinarian-recommended dental treats. Teenie size offers the most appropriate texture and hardness for dogs that weigh 5-15 pounds. 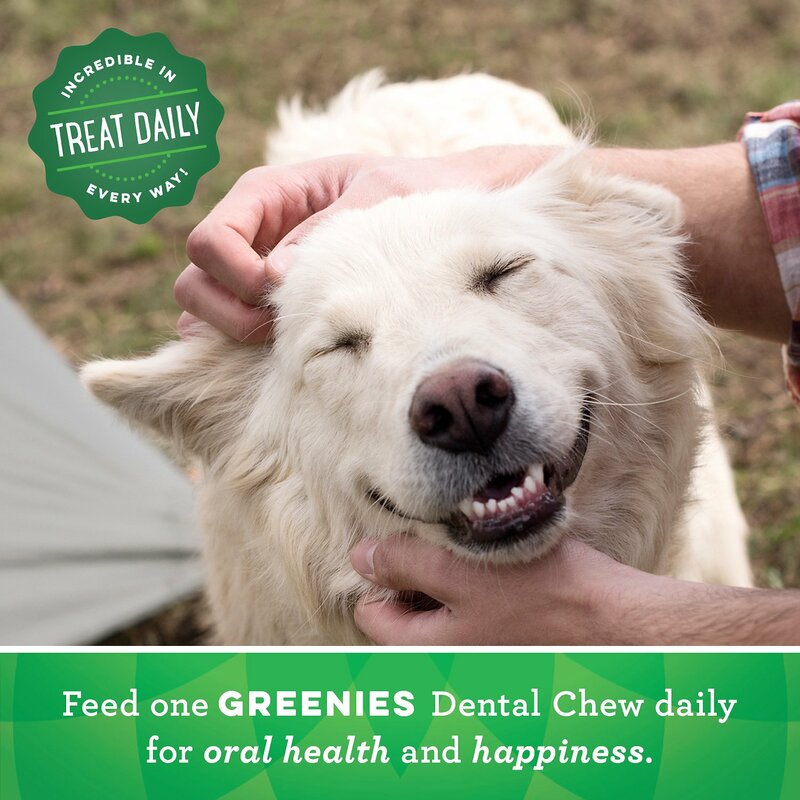 Feed 1 GREENIES™ Dental Treat per day. For dogs 5 - 15 lbs. Not suitable for dogs less than 5 lbs, or dogs less than 6 months of age. Fresh drinking water should always be available. ATTENTION: As with any edible product, monitor your dog to ensure the treat is adequately chewed. Gulping any item can be harmful or even fatal to a dog. 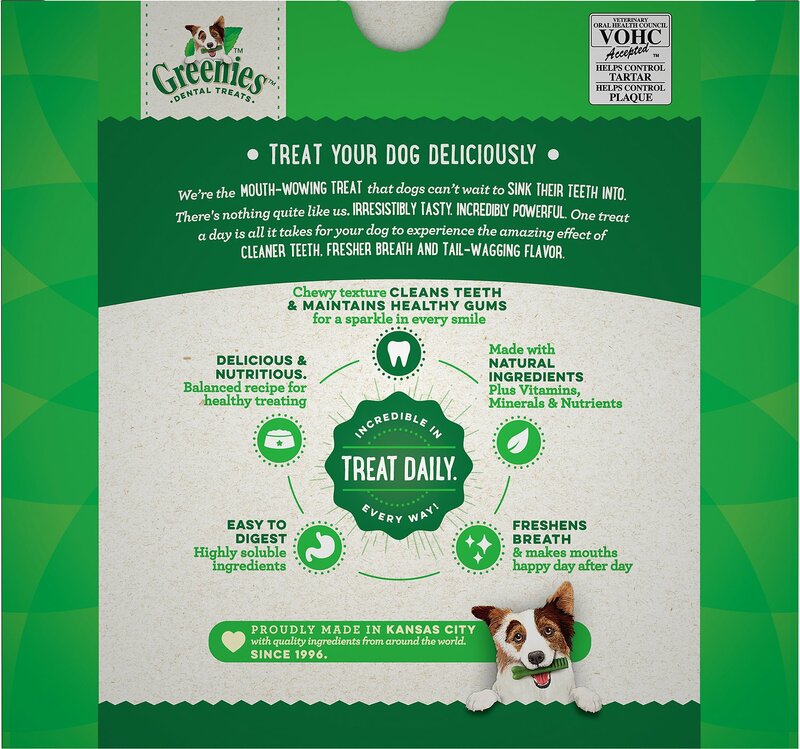 For each GREENIES™ dental treat fed, reduce your dog’s main meal by 26 kcal. Complete oral care is important for your dog's total body health, and can even add years to his lifespan. 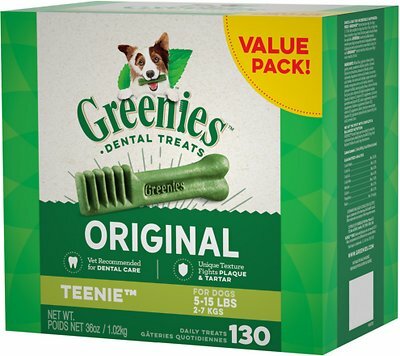 Greenies dental chews are recommended by veterinarians because they're proven to clean dogs' teeth by fighting both plaque and tartar buildup. They also help maintain healthy gums and freshen your pup's breath. These delicious chews are low in fat and nutritionally complete for adult dogs, making them the perfect everyday treat. One dental chew a day can help clean your dog's teeth as the natural chewing action wipes away plaque and tartar buildup from the surface. 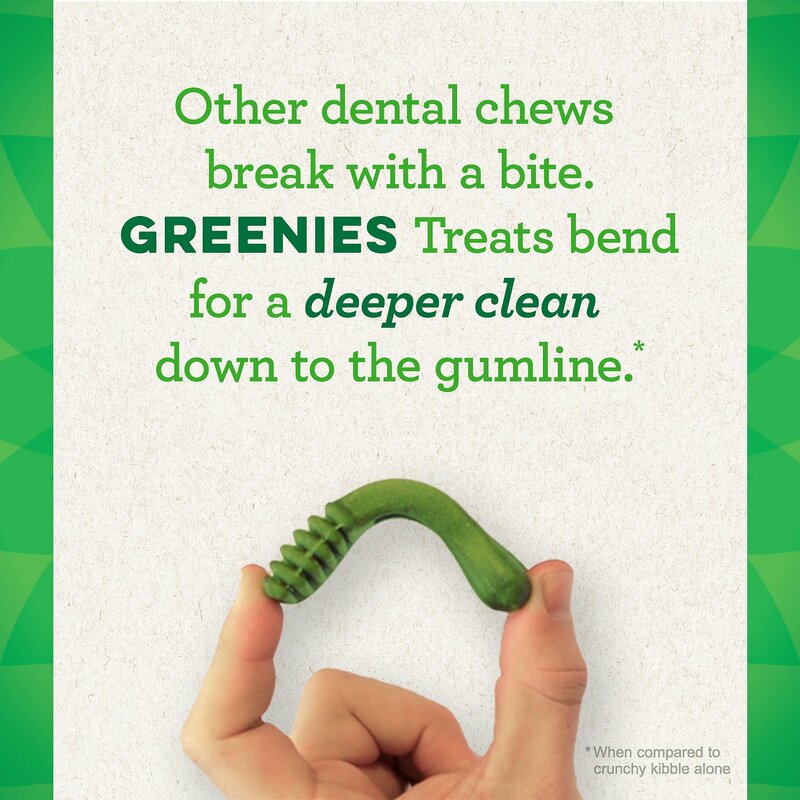 Independent testing revealed Greenies dental chews are highly palatable with a great taste that appeals to pups. Highly soluble ingredients help these dental chews break down quickly for easy digestion, making them more digestible than premium dry dog food. These dental chews come in several unique sizes to offer the most appropriate texture and hardness for dogs with a variety of bite-force capabilities. Greenies dental chews have The Veterinary Oral Health Council Seal of Acceptance for plaque and tartar control. 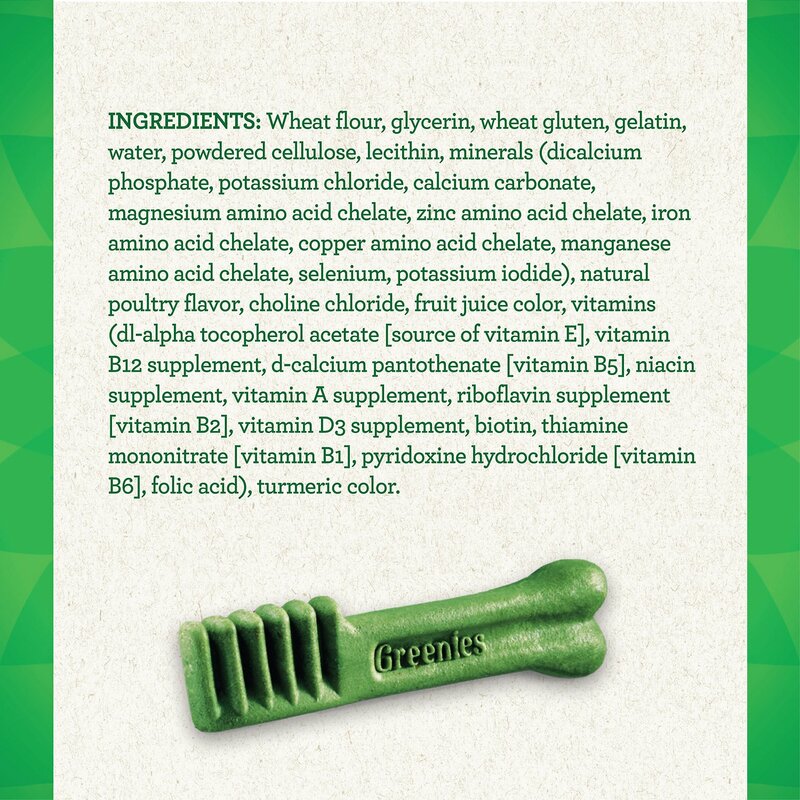 Greenies treats are made to bend instead of break when your dog bites down. This unique flexibility allows them to clean all the way down to the gum line. Your pup's teeth will sink right into the grooves, helping to remove plaque and prevent further tartar buildup. 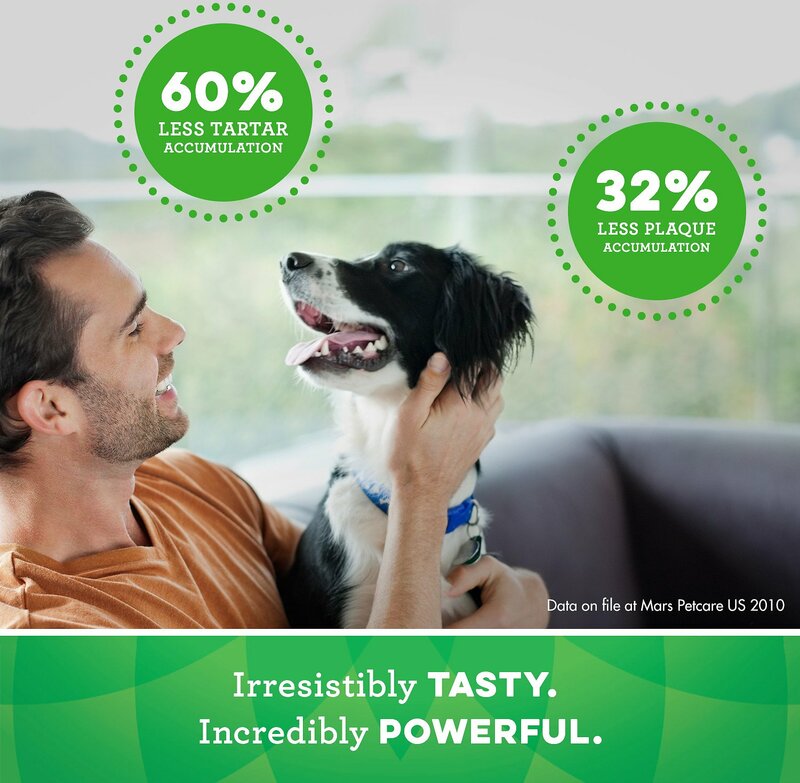 For an on-the-go solution, try Greenies Breath Buster Bites. These dog-friendly breath mints are bite-size, only 15 calories per treat, and easy to digest. 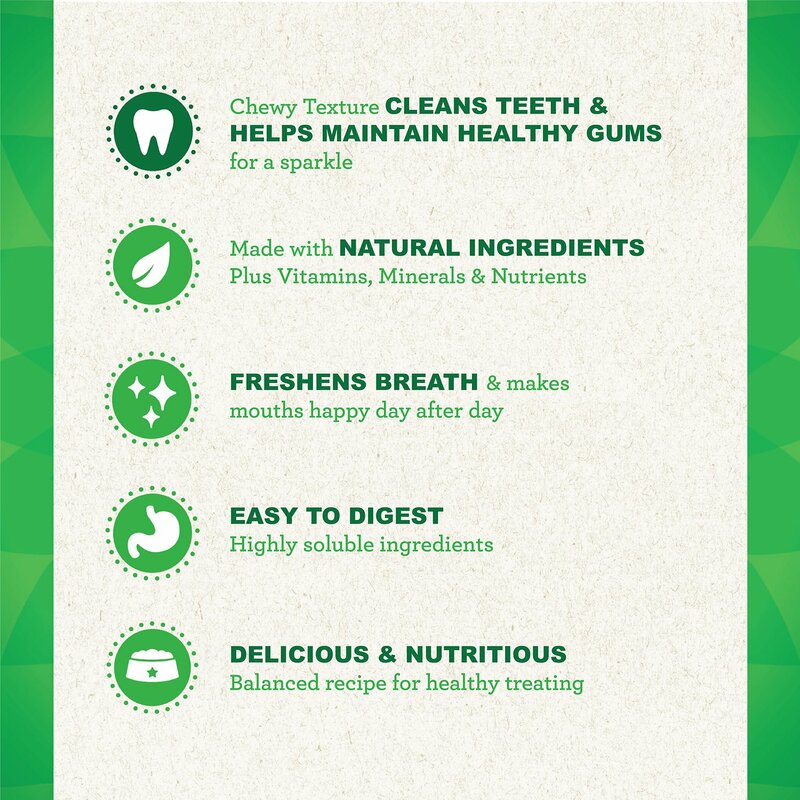 Greenies dental chews for dogs feature a wide variety of treat options so pups of all shapes and sizes can benefit from clean and healthy teeth. From weight management and joint health formulas to grain-free recipes and those with a blueberry or spearmint flavor, Greenies has a treat that's perfectly suited to your pet's needs. My two Yorkie's love them. I like to give them something that not only taste good but is good for their teeth too. Small dogs tend to have so many issues with their teeth. I have been using these for years and my little guys are now 9 and still have everyone of their teeth and have never had any dental issues. Although I am not a vet, I do know that my 1 1/2 yr old Yorkie has very white teeth (per her vet). She waits daily for her greenie treat and the teenie is perfect for her. Chewy is the best when it comes to products for my best friend. A buy these for my dog regularly. He's a little Morkie. I started buying Greenies when I first adopted him. I give him a Teenie Greenie every morning almost like a toothbrush / snack. His veterinarian says his teeth are the best she's seen on a little dog. He loves them. We call this treat a "go to work greenie ". Domino looks forward to his treat in the morning before we leave for work. Chewy has a great price on these treats and my cat Hunter loves Chewy too! The dental treats are great! It is the length of time it took to get here and the condition of the box! Tape was nearly off, box beat up and one pack out of 7 was missing. Figured wouldn’t do any good to complain since it took days for two separate orders to get here. I used these for my yorkie and he loved them. However I was not aware that I couldn’t use for my puppy for 4 months. Disappointed that the expire date is closer than that. Cami loves these treats and we give them to her when we’ve been gone and come home. She knows she gets one and even points us to the pantry in case we should forget. They help her breath and teeth too.